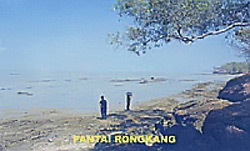 Rongkang beach is located in Kwanyar, 35 km south of Bangkalan city. Like Maneron beach, this beach condition is still experiencing, and requires the investor presence. The tourism potency is rock coast area along the length of 1 km more than its extent of hill that having height of 20 to 25 meters dpl, and have crop habitat that is “Jambu keluthu'” (Guava). The beauty of this beach also shown the boats grass in Madura strait. If dusk arrived, seems to be pride shimmer light of town and ship lamps.